Golden Apples: Beltane, May Day, Lei Day, What ever you call it, its the 1st! Strange, Strange... I know I am strange! Beltane, May Day, Lei Day, What ever you call it, its the 1st! When I was a kid, and read or watched on TV, idea's of what the future would be like was very different than today's reality. Most futurist in the 1950 and 1960's totally missed the advent and growth of home computers; and home broadcasting was never a part of the vision! The Movies were interesting, but there was no sound (you needed a seperate recording devise) and the amount of light needed was blinding, (we are always squinting!) Setting up the camera was a big deal (there were so many things to adjust and get right-- Once set up—the whole thing was bulky and awkward especially for indoor shots.. there was never any doubt that the camera was on—and all to often people mugged for the show. But we didn't just have home movies of parties and trips to the zoo, we had real movies too. The best were the reels of Abbot and Costello films, (silent movies with story cards for dialog!) that my dad had purchased. Many a holiday was finished off watch Abbot and Costello meet the Werewolf (or the Count Dracula, or Frankenstein) again. What a different world today! I have been experimenting with making You Tube video's. (What, I should be different from the rest of the world?) --And I have been doing some house cleaning on my blog (more to come!). Right now, (a bit hard to find) but it's there—I've added link to my “Page of Links”--A one stop shopping center to find free Patterns, tutorials, recipes, on my blog, and a small but growing collection of knitting and non-knitting pages I find interesting. There are more links to come—this is a work in progress—I want/need to edit the page some more –First I need to brush up on some of my html codes!-- to also make the page easier to navigate. With 'quick links' inside the page, so you don't have to scroll through the entire thing to find things. One of the New set of Links on the page are a small (but growing) set of You Tube cast on tutorials. There is one video for long tail, (and several variations) and a crochet cast on –for non-crocheter's—a no waste yarn version of the Italian (aka tubular) cast on.. a growing collections. The newest (and so far, the best--practice does actually improve things!) is a Channel Island Cast on. Eventually I want to have a complete collection of all the cast on's I know—Of course, some of them will have to be redone, --as my skills improve but in the meanwhile enjoy this free mini class on how to do the Channel Island cast on. I hope you'll look at the others, too! Happy 47th birthday HofT! You are now younger than me! I think I may try that trick too! The how to is fantastic. Very clear and now I understand that cast on perfectly. It is murky to me in written instructions. I am going to try it for socks first. Yo, baby, you don't need no steenkin' collaboration! That is a beautifully clear demonstration as it stands. Also - your voice really lends itself to video instruction. 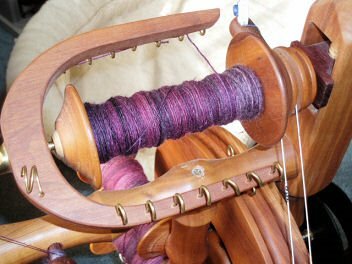 The cadence and tone are quite different from your conversation, and you sound sort of seductively comforting, exactly what the doctor ordered for people who are nervous about trying new things with their knitting. You don't sound a thing like I had imagined you'd sound! It's always great to see/hear what online friends sound like in person. These videos are great. Keep 'em coming! Fantastic - I'm amazed you're not completely daunted at the project considering *all* the cast-ons you know. Thank you, in advance, for taking this on. You're wonderful. Thanks for the great video. I linked to it from a Lisa post on Ravelry.